Love and respect him as I do, at times Alan Pardew goes a little bit too far. When he speaks positively about some of our players, the manager can go way too far in terms of bigging them up and trying to give certain individuals that little extra confidence and belief to bring them on. Pardew occasionally goes too far and turns it into a negative as many fans just think ‘hold on, I watched that match/player and I’m not daft’. It is a bit like some parents with their kids, you sit there happily listening to them telling (bragging) you how well they are doing at school, sport, or whatever…then you think ‘hold on, surely this child prodigy equivalent of Lionel Messi/Stephen Hawking would have made the papers by now’. “Gabby is only being kept out by the form of Ben Arfa. He has been unlucky, he’s been terrific in the last two games in Europe. He frightens teams and puts them on the back foot. Last year he played in a lot of games when we avoided defeat. Teams are worried about his pace, he is unlucky not to be in the team”. Obertan pushing Ben Arfa…..I hope it’s not down the stairs! If I turned up and saw Obertan instead of Ben Arfa in the team I’d not be a happy man. Obertan is (certainly) no better or worse than he has always been for us. He runs up and down the pitch hardly ever taking his man on, simply passing the ball/buck to somebody else, a bit like last night actually! Yes he took his goal well but Sammy Ameobi did all the hard work and it was a clear path to goal for ‘Gabby’, to either hit or miss. Against the European opposition he’s managed to make a goal (v Bordeaux) and score one, plus he won a few corners in both matches, that is it. I really hope he does become a star in stripes but my eyes don’t tell me that is remotely ever going to happen. 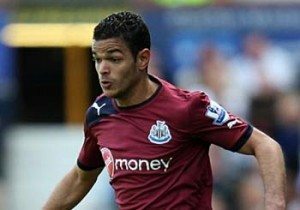 With Hatem Ben Arfa I have seen magical moments that are right up there with the very best memories of the last forty years and I dream of seeing more every time I walk up the hill to St.James’ Park. I don’t need to be given nightmares thinking that Alan Pardew could inflict Obertan regularly on us if Ben Arfa has a few average matches.